Georges Seurat was a revolutionary artist who is remembered for his many exquisite drawings that dramatised “the relationship between light and shadow” (*EN1), for his “invention” and use of pointillism (divisionism), for his contribution to the foundation of a neo-impressionistic art movement and for his monumental and initially highly controversial painting, A Sunday Afternoon on the Island of La Grande Jatte. He was born in Paris in December of 1859 and lived, in rather unexceptional and simple circumstances; he was a private man with a conservative background, an artist with a scientific bent, consistently experimenting with and applying new knowledge in colour theory as well as methodically perfecting his painting technique. He, in all probability did not envisage that he would set the art world on edge with his innovative yet concise painting style, that particular conflict occurred as a result of Seurat’s own inner tension, the contradiction between art and science, a battle between emotion and reason, visually evident through his highly emotive drawings and his remote and distant masterpiece that invites the viewers’ curiosity but leaves every question unanswered. Seurat was born to a middle class, conservative family, his father a Municipal Bailiff, sent him to a Municipal School where he began to take classical drawing classes, making studies of antique casts and live models (*EN2). He soon after entered Ecole des Beaux-Arts attending the studio of Henri Lehman – a devotee of Ingres and “defender of the classical tradition” (*EN3), here as a student, he produced several drawings and begins to paint, whilst admiring the work of Eugene Delacroix who is described by the poet Baudelaire as being “passionately in love with passion, but coldly determined to express passion clearly”(*EN4). These drawings, though technically constructed, lacked the ambience and emotive qualities of his later sketches. Seurat’s major development in drawing occurred during his time in the military (1879 - 1880), where the shortage of live models and sculptures lead him to draw what was readily available, fellow recruits at rest and his own hands. His sketchbooks throughout this time also depict the local parks and plaza’s where he made quick drawings of “people on park benches, city wanderers and architectural detail” (*EN5). Gradually Seurat refined his drawing technique and limited his materials, eventually centering on the sole use of two main elements, a paper support and a dark conté crayon which he used to create “a dazzling array of effects, from the bright lights of the outdoors to the intimate interiors of homes” (*EN6). He was also known to use both sides of Michallet paper, the wire side and the felt side to enhance the various effects he’d created. Seurat’s drawn portrait of his close friend Aman-Jean was accepted to the Salon in 1883 and became his first publicly exhibited piece. It was large, exceptionally constructed and described by critic Claude Roger-Marx as “a meritorious drawing that cannot be the work of a newcomer” (*EN7). Aman-Jean himself, also admired the work calling it “very, very beautiful” (*EN8). It was a beautiful portrait that succeeded in cementing Seurat’s work firmly in art history, it also exemplified some of the key characteristics; the “velvety blackness and glowing luminosity” that have become a signature of Seurat and his drawing style (*EN9). 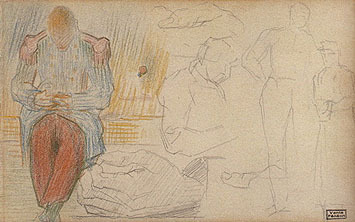 Drawing was an important activity for Seurat and he continued to apply himself to the task throughout his tragically short lifetime (he died aged thirty one, while his career spanned a mere eleven years), producing more than five hundred drawn works, two hundred and seventy of which were produced after his maturity. He was described as being “a young man crazy about drawing” and that he often “took refuge in pure drawing” (*EN10). The majority of these were individual pieces, but many were created as studies for larger projects and formed the foundations of these well-considered canvases. “There are fewer than 60 surviving oil sketches and drawings by the artist that are directly related to the painting” (*EN11), La Grande Jatte which debuted at the eighth annual and final impressionist exhibition (*EN12) in 1886 and created a new confusion in a culture that was only beginning to accept impressionism. 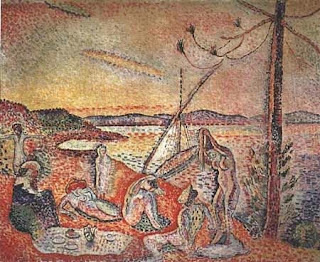 There was debate as to whether Seurat was an artist or a scientist; and concern that his application of colour theories espoused by Ogden Rood and Charles Blanc (*EN13) created painted tapestries where dots of colour were blended by the eye and not on a pallet. Seurat chose his colours carefully and made his strokes deliberately believing that certain combinations of colour and strokes created differing moods. The technique is often called “pointillism”, though the term “divisionism” is more correct referring to the “separation of colour and its optical effects” (*EN14). La Grande Jatte, though exhibited in an impressionist exhibition was nothing like impressionism, it was “an un-Romantic exercise in measurement, objectivity, logic, control, with formal decisions made and conceptually resolved before brush touched canvas” (*EN15). Seurat was joined by Paul Signac, Camille Pissarro, Lucien Pissarro, and eventually Henri Matisse, who all produced paintings using the divisionist technique, and so in an effort to describe the new movement that arose from the interest and controversy of that final exhibition the term Neo-Impressionism was coined by Felix Feneon, a French art critic. The painting La Grande Jatte was submitted by the Art Institute of Chicago (it’s owners) for extensive technical testing prior to it’s exhibition “Seurat and the Making of La Grande Jatte” in 2004, the findings confirmed that Seurat reworked the painting prior to it’s exhibition, and revealed some fundamental alterations that suggest “he wasn't a scientific prodigy who happened to end up in art, but a prodigious artist learning on the job” (*EN16). Figures were added, altered and removed from the final canvas; the painting, initially comprising of strokes of varying lengths and directions was over laid with the complimentary coloured dots for which the work is renowned. He then added a painted border, until the canvas is complete with it’s many characters (3 dogs, 8 boats, and 48 people (*EN17)) as it is known today. We can conclude that Seurat’s extensive study of colour theory and of the artists he admired like Delacroix, ensured that he harvested and developed new understandings and skills. His diligent practice and preparation hints that he was a perfectionist, and that he strove to produce works that were satisfying and complete. The evidence of multiple studies and reworking suggests that he perhaps agonised over these projects, that he wished to produce works that would be appreciated by his artistic fellows, the mere fact he exhibited his work implies a desire to share his creations. The controversy that arose from La Grande Jatte, although initially unexpected is a natural consequence that arose from his determined exploration. He did not set out to create a furore, but it was inevitable that he did so. 8 Aman-Jean, letters to Gustave Coquiot, published in Herbert et al., Georges Seurat, 1859-1891, Appendix B pp377 (emphasis original), 376. 10 Gustave Kahn, Les Dessins de Georges Seurat, 1859 – 1891, vol 1 (Paris: Bernheim-Juene, 1928), n.p. ; and Gustave Kahn, “Seurat”, translated and excerpted in Alain Madeleine-Pedrillat, Seurat (New York: Rizzoli, 1990), p.206. Originally published in L’Art moderne (April 5, 1891). 14 http://www.britannica.com/EBchecked/topic/1430924/divisionism cited 1st May 2011.